75in 4K HDR TV for under £1.5k: is this Hitachi the bargain of the year? | What Hi-Fi? Hitachi (now manufactured by Turkish company Vestel, which also owns budget TV brand Finlux) is no stranger to offering big TVs for small budgets. But a mammoth 75in 4K screen for just £1500? It could be an early contender for bargain of the year. For that price, you can barely get a good 55in 4K OLED TV for £1500, let alone a 75in screen. Sony's current flagship 4K LCD TV, the 75in ZD9, will set you back around £7000. 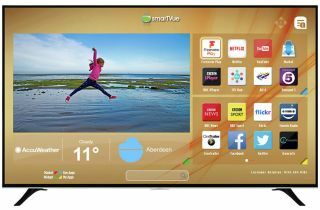 The last time we tested a Hitachi TV – a 50in Full HD for £380 – it failed to make an impression, but this 75in giant has all the ingredients of a decent smart TV. This 4K LCD TV comes with a Freeview HD tuner and Freeview Play, which gives you access to the UK's main catch-up services, including BBC iPlayer, ITV Hub, All4 and Demand 5. Other video apps, such as Netflix and YouTube, are available through Hitachi's smart TV platform, smarTVue. Connections include three HDMI inputs, two USB ports and an optical output. In terms of HDR, the TV supports the standard HDR10 format. There's no word yet on whether it also supports the dynamic alternatives of HDR (HDR10+ and Dolby Vision) or the broadcast-variant HLG. Hitachi's 75in 4K TV is available now, exclusively from Argos, for £1500.